The 8th Special Forces Group of the United States Army was established in 1963 at Fort Gulick, Panama Canal Zone. The primary mission of the 8th Special Forces Group (Airborne) [(SFG(A)] was counter-insurgency training for the armies of Latin America. Some training was performed under the sponsorship of the School of the Americas, also located at Fort Gulick. In May 1962, the advance party from Company D, 7th SFG(A) departed from Ft. Bragg, NC to Fort Gulick, Panama, at that time in the Panama Canal Zone, to establish the 8th SFG(A). Three months later, in August 1962, Major Melvin J. Sowards, Commander of Company D, 7th SFG(A) moved the main body of the company to the Canal Zone. They would be followed by augmentation detachments. Upon their arrival, the basic organization of the Special Action Force (SAF) was completed and Lieutenant Colonel Sawyer assumed command. The legendary Lieutenant Colonel Arthur D. Simons, aka "Bull", then took command of Company D, 7th SFG(A) 18 January 1963 and LTC Sawyer became the Executive Officer. 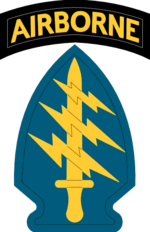 On 12 April 1963, under the command of LTC Simons, the SAF elements of the 7th SFG(A) were officially redesignated, as authorized by the Department of the Army and the 8th SFG(A) was activated. The 8th's full designation was 8th Special Forces Group (ABN), Special Action Force (SAF), Latin America. The 8th was the US Army's only full SAF. In addition to the two line Special Forces companies, the SAF included a Military Intelligence detachment, a Medical detachment, a Military Police detachment, an Engineer detachment, an Army Security Agency detachment, and a Psychological Operations battalion. Special Forces at this time didn't use designators like "battalion". A Special Forces company (which later became a battalion) was commanded by a Lt. Colonel and was designated as a "C" team. The 8th had 2 "C" teams. Each "C" team had 3 "B" teams and each "B" team had 5 "A" teams. The 8th SAF also operated the NCO Academy, Airborne School and Underwater Operations School for the United States Army South (USARSO). They also provided support for the Jungle Warfare School at Fort Sherman, later renamed the Jungle Operations Training Center to be politically correct. Company A of the 8th Group was tasked with developing and maintaining a High Altitude Low Opening (HALO) team, Detachment A-13, that was prepared to make covert free-fall entry to denied airspace by jumping from altitudes in excess of 30,000 feet. The team trained at the abandoned airstrip at Rio Hato, Panama, and conducted the first HALO school outside of Ft. Bragg, North Carolina, at Fort Kobbe and Howard Air Force Base, Canal Zone, in 1970. The HALO team also had a good-will mission as the "Jumping Ambassadors" and conducted exhibition parachute jumps at carnivals, festivals and other public events throughout Latin America. A Mobile Training Team (MTT) from the 8th Special Forces Group trained and advised the Bolivian Ranger Battalion that captured and killed Che Guevara in the fall of 1967. Prior to that time, MTT's from the 8th Special Forces Group trained counter-insurgent units in Venezuela, Colombia, and Ecuador that killed three of Che Guevara's best friends and Lieutenants that he had personally dispatched to those three nations to foment revolutions. MTT's were sent to Argentina from 1962 to 1970 to provide training in recoilless rifles to their army, road construction/maintenance, logistics, as well as English language skills. MTT's from the 8th Special Forces Group also assisted the Venezuelan Army in the construction of their jump school. They trained the first students and the cadre for following classes. They also assisted the Dominican Republic by training a Dominican Army mountain battalion in counter guerrilla warfare. At the U.S. Army Airborne School at Ft Sherman in the U.S. Canal Zone, a team of the 8th Special Forces Group trained Guatemalan airborne personnel. Colonel Robert J. "Bobby Joe" Pinkerton (21 August 1927 – 15 October 2002) was the final commanding officer of the 8th SFG(A) from 20 August 1971 to its deactivation on 30 June 1972. He arrived in Panama directly from Vietnam faced with task of deactivating the 8th Special Action Force for Latin America and the 8th Special Forces Group (Airborne). This 8th group reality operated up to 1980. Upon retiring the colors of the 8th Special Forces Group (Airborne) he became the commander of the Security Assistance Force and became dual hatted as the commander of the Atlantic Garrison. One of the reasons for the deactivation of the 8th SFG(A) in 1972 was the draw down during the waning years of the Vietnam build up. At the same time, Special Forces was reorganizing into Battalions rather than Companies. It made sense that the 8th became the 3rd Battalion of the 7th SFG(A), because it was an element of the 7th that began the set up of the 8th SFG(A) in 1962. Upon reorganization the 3rd BN 7th SFG(A) consisted of 3 SF line companies, "B" Teams with 5 "A" Teams and a Headquarters Company which provided support including a rigger detachment. A-5 (A Company) was designated as The Airborne School Team, A-10 (B Company) was the HALO Team and "The Jumping Ambassadors" and A-15 (C Company) was the SCUBA Team. ^ Birtle, Andrew J. (2005). United States Army Counterinsurgency and Contingency Operations Doctrine, 1942-1976. Washington, DC: Government Printing Office. p. 298. ISBN 0-16-072960-2. ^ Stanton, Doug (24 June 2009). "The Quiet Professionals: The Untold Story of U.S. Special Forces in Afghanistan". Huffington Post. ^ "Most Popular E-mail Newsletter". USA Today. 9 November 2011. ^ Sincere, Clyde (1990). USA Airborne 50th Anniversary Commemorative History. Nashville, Tennessee: Turner Publishing Company. pp. 324–347. ISBN 0-938021-90-7. ^ Loveman, Brian (2010). No Higher Law: American Foreign Policy and the Western Hemisphere Since 1776. Chapel Hill, NC: Univ of North Carolina Press. p. 294. ISBN 978-0-8078-3371-1. ^ a b "History - 8th Special Forces Group". Retrieved 7 August 2013. ^ Loveman, Brian. For La Patria: Politics and the Armed Forces in Latin America. Rowman & Littlefield Publishers, 1999. Retrieved 12 April 2013. ^ "Capture of Che Gueverra". Wayne Kirkbride. Retrieved 12 April 2013. ^ "Operations in Argentina". Wayne Kirkbride. Retrieved 12 April 2013.